The RMS-108 Marasai was developed using Zeon design principles combined with technology pioneered by the Earth Federation during the One Year War. Technologically based on the RMS-106 Hizack the Marasai features improved technologies, such as a Gundarium alloy armor instead of a titanium alloy that improves overall defense, greater sensor range, greater acceleration, and a more powerful Minovsky type ultracompact fusion reactor. Alongside its technological improvements the Marasai is also several metric tons lighter than Hizack when measuring its empty weight. 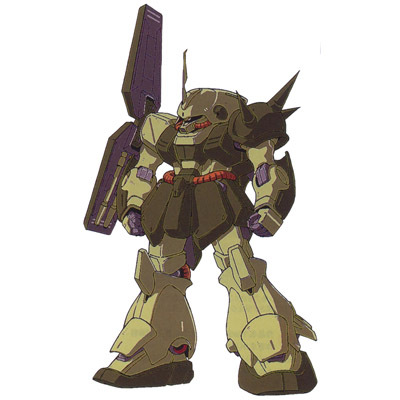 The Marasai did not have as a large a weapon selection as the Hizack, however that would be because the Hizack was often equipped with older weapons used by Zakus, such as machine guns and heat hawks, while the Marasai used only advanced beam weapons. The Marasai was also compatible with the ballute system if it needed to conduct and atmospheric reentry on its own. The standard Marasai's weapons were a rapid-firing beam rifle capable of shooting three beams in rapid succession, a beam saber, and two head mounted Vulcan guns on the sides of its head. A large shield was attached to the right shoulder, much like the Zaku line of mobile suits. Originally designed by Anaheim Electronics for the Anti Earth Union Group as the RX-107 Rosette, it was designed to be an all round better version of the RMS-106 Hi-Zack. However, due to pressure from the Titans, Anaheim presented them with the design when the Titans started to turn their attention towards Anaheim support of the AEUG. Despite initially being used by an organization whose very duty was to seek out and destroy anti-Federation or revivalist Zeon movements, after the Gryps Conflict the Marasai would be used almost exclusively by Neo Zeon movements. After the Gryps Conflict ended, the Earth Federation sought to distance itself from connection to the Titans, which included abandoning numerous mobile suit designs that were used by the Titans (no matter how effective they were). The abandoned Marasai were picked up by the first Neo Zeon, Haman Karn's Zeon, who used the machines to fill out their ranks. After the First Neo Zeon War many of the Marasai had been destroyed. Some of those that survived would be used by old Principality of Zeon remnants, who would repaint the Marasai in their own distinctive green color scheme. In U.C. 0095, several of these mobile suits still exist.